Its origin, the cider is obliged by French peasants who found a great way of processing apples. Over time, Apple wine became widely known far beyond the borders of France, sold a number of its varieties hardly incalculable. And, you can try to cook the cider on their own. For making cider at home you will need a juice extractor, sugar, wine yeast, plastic containers, special curved pipe of wine, and of course, apples. From 50 kilograms of fruit should be about 30 liters of finished wine. The apples must be ripe and free of any visible damage. Grade this is a large value, the cider can be made from any apples, even sour, but it will need to increase the amount of sugar used for cooking. The sugar in the cider can be replaced with adding pears in an amount of 10-30% of the total weight of the fruit. Prepare the apples to push them out of the juice. You can just cut them in pieces and pass through the juicer, and you can do them just as well, as did the French peasants, finely chop, place in a container, crush the pulp, place on a linen towel, carefully squeeze the resulting mass of juice. Pour the finished juice into a plastic container, a role which can carry a small canister or conventional plastic bottles. To ferment the cider is best left at a temperature slightly below room approximately 16 -18 ° C.
But the cans and bottles needs to be able to unclog them with a special wine tube, whose role is to allow released during fermentation gas is freely discharged to the outside and to simultaneously prevent the penetration of external air to the fermenting liquid. At the very least you can do without such a tube by wrapping a bottle of the most ordinary tube. But then you have each day to loosen it half a turn and immediately as soon as the gas inside will come out, tighten back, not to run the air inside. Some, especially aged varieties of cider can Mature almost about a year. To juice add sugar at the rate of 1-1. 5 kg per kilogram of apples. Basically, no other supplements are necessary. 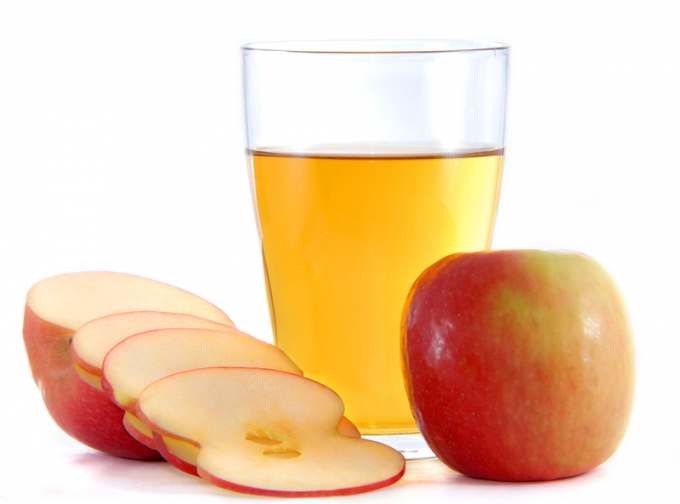 In apples already contains some amount of yeast required for fermentation, you will just have to wait and periodically monitor the withdrawal of gases. For the full maturation of cider requires about 3 months. If you want to speed up the process, you can buy a special wine yeast. With their help, the cider will be ready in 2-3 weeks from the beginning of the cooking.